1860 - On August 12, 1860, Archbishop Joseph Alemany blessed a small chapel with a room attached. This structure on Matheson Street was purchased by Fr. Luigi Angelo Maria de Rossi for the celebration of Mass in Healdsburg and for the clergy who traveled here from Freestone and Tomales. 1873 - On November 9 this structure became the rectory and a steepled church on the Corner of Matheson and East Streets was dedicated as St. John the Baptist Church. It was a mission of Tomales. 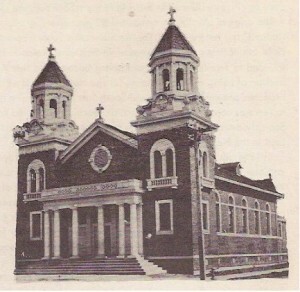 1877 - St. John the Baptist Church became a mission of St. Rose Church in Santa Rosa. 1884 - On May 24, St. John the Baptist was established as a Parish. St. John the Baptist Parish is the mother church of St. Peter’s in Cloverdale, Our Lady of Mt. Carmel in Asti, St. Elizabeth in Guerneville and its missions, and Our Lady of Guadalupe in Windsor. 1910 - St John the Baptist Catholic Church 1910. A larger church was dedicated on March 13 to serve an increased Catholic population. 1934 - The parish acquired a gymnasium and hall. 1950 - Fr. Michael Galvin and parish lay leaders acquired the former public grammar school on the corner of Tucker and Fitch Streets for a parochial school. The Sisters of the Holy Infant Jesus came to Healdsburg from Ireland to staff the school. The school opened its doors on September 18, 1950. Eighty-nine students were enrolled in grades 1-6. It wasn’t until 1954 that the classroom building presently housing grades 1 – 4 was constructed. 1956 - The original building, purchased by Fr. Rossi, was removed and the present rectory was constructed. A convent and novitiate were also built on the corner of Tucker and Fitch Streets. 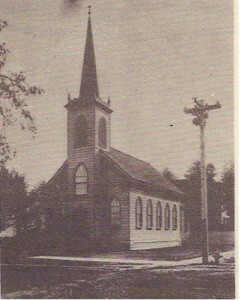 1965 - The present church was erected. It is the largest church building in Sonoma County and the second largest church in the Diocese of Santa Rosa. 1986 - The sisters departed St. John School and the school was entirely staffed by dedicated lay teachers. The convent was sold in 1989 and the property adjacent to the school, owned by the Federated Church, was acquired. 1989 - In October, the Loma Prieta earthquake made the original school building and the Parish Hall unusable. After the demolition, new classrooms were erected and the other parish buildings were retrofitted, repaired and refurbished. 2003 - A new Parish Activity Center/Gymnasium was completed and dedicated. 2007 - The school remodeled Fintan Hall and it now serves as a library/art room. A new music room and 8th grade classroom were also added. 2008 - The kitchen in the Parish Activity Center/Gymnasium was upgraded. 2016- St. Gianna Chapel completed, with altar from original St. Johns Church. St. Gianna Beretta Molla is the patron saint of mothers, physicians, and unborn children.